In San Diego we meet once a month to plan for the next run that will pass through the San Diego region in the summer of 2012. This takes an enormous amount of planning and resources, it is for that reason we are meeting now to plan for an event two years away. We also help organize other communities including, riverside county, and baja california. If you are interested in supporting this very important sacred run, please contact me by leaving a comment and I will get back to you. Your comment will not be posted, but I will be sent a notification. I am Nuxalkmc of the Nuxalk Nation on the west coast of B.C. Canada. I am a grandmother and am raising my 6 year old grand daughter. I am interested in supporting this endeavor, however I am able. I am considering the journey myself..with my grand daughter(s)?! There is a young girl who has been involved with this journey twice; her name is Crystal Schooner(Lucas). she is also from this community. I look forward to hearing from your.. 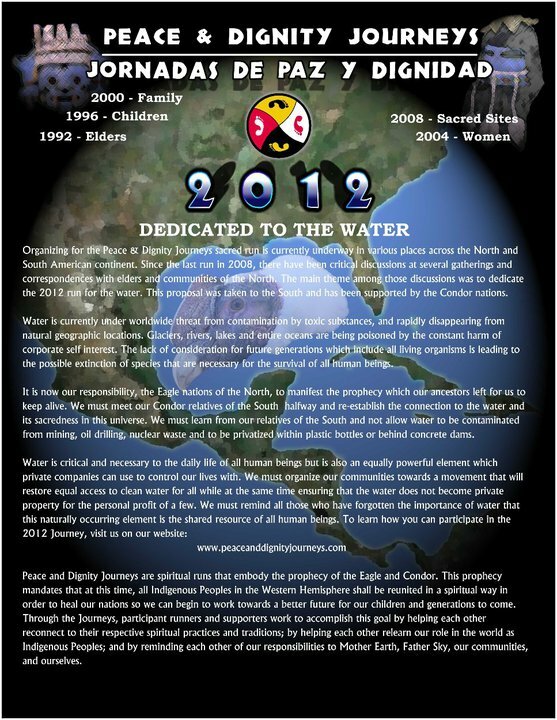 I would like to assist/help in the 2012 run… your next monthly meeting is in January,?que no? Please let me know and I’ll attend. Sorry I missed your message. yes we had a meeting in January our next meeting is in Feb. I will directly.